Andersen Air Force Base is a 20,000-acre site located in the city of Yigo on the northern end of the island of Guam. Operational since 1940, AAFB's main purpose has been to provide support for Strategic Air Command operations. 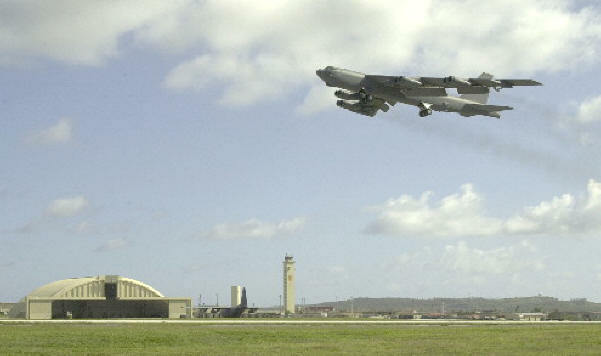 The 3960th Strategic Wing was a early to mid 1960's B-52 and KC-135 controlling unit from Andersen AFB, Guam. It was used until B-52's and tankers began to sink the Island under their rapidly increasing build-up and required a better command structure. 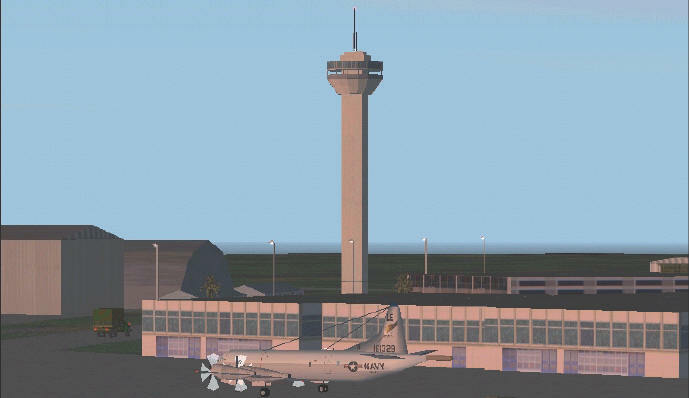 Andersen Air Force Base is home to Pacific Air Forces� 13th Air Force and the 36th Air Base Wing, Air Mobility Command�s 634th Air Mobility Support Squadron and several other tenant organizations. In 1950, Congress passed the Organic Act, which gave Chamorros citizenship, and Guam became an organized unincorporated territory of the United States. The president appointed the governor, and the administration fell under the jurisdiction of the Department of the Interior. Guam's first popularly elected governor took office in 1971. Guam elected its first delegate to the U.S. Congress in 1972. Guam is only three jet-hours away from the Asian capitals of Tokyo, Taipei and Manila, and it welcomed more than 1 million tourists in 1999. The island is Japan's playground. Situated in the Western Pacific, across the International Date Line at 13�28" north latitude and 114�45" east longitude, it is the largest of more than 2,000 islands scattered between Hawaii and the Philippines. With about 150,000 residents and more than 13,000 military personnel and their family members, Guam is the most populated island in the geographical area known as Micronesia. Two hundred and twelve square miles in size, the island is part of an underwater mountain range running southward from Japan, and is the southernmost island in the Marianas archipelago. Andersen traces its roots back to a tent on Pati Point in 1944 during the early days of World War II when four men of the 854th Airfield Construction Battalion "Spearheaders" stood at a drafting table, drawing lines on a blueprint. Those lines would define the runways, taxiways and parking aprons that would later become Andersen Air Force Base. The area on Guam on which the Spearheaders drew the lines was known as a forest area � an almost impenetrable stand of trees and brush that covered the northern end of Guam. By February 1945, a runway complex was operational at what was then known as North Field. By June the finishing touches were almost complete and North Field aircraft began daily bombing missions over Japan. The field was redesignated North Guam Air Force Base in 1947 � the same year the Air Force became a separate service. Two years later, the base was renamed in honor of Brig. Gen. Roy Andersen. Andersen had been chief of staff at Harmon Field, Guam, when his aircraft disappeared en route to Hawaii in February 1945. When fighting erupted in Korea, Guam became a focal point for aircraft and material flying west. In 1951, Andersen began supporting rotational bomber deployments from stateside bases, first with B-29s, and eventually hosting B-36, B-47 and, in 1964, B-52 units. For the next six years, Strategic Air Command trained and practiced its wartime skills � which would be tested time and time again as the conflict in Southeast Asia escalated. Andersen would play a major part in the Vietnam conflict, when 27 B-52 bombers were launched from its runway June 18, 1965. The aircraft initiated Operation Arc Light, bombing missions over North and South Vietnam to strike Viet Cong base operations and enemy troop concentrations and supply lines. Arc Light missions continued for eight years. In 1972 Andersen was the site of the most massive build up of airpower in history. More than 15,000 people and more than 150 B-52s lined all available flight line space. During Operation Linebacker II in December 1972, bombers stationed at Andersen flew 729 sorties in 11 days, resulting in renewed peace talks in Paris. The post-Vietnam period brought a return to routine operations at Andersen, with the base remaining a vital overseas platform for carrying Strategic Air Command�s global-deterrence mission. In October 1988, the host 43rd Bombardment Wing traded its nuclear-deterrent role for a conventional mission. One year later, the bomb wing began redeploying to stateside bases, and Andersen transitioned from SAC to Pacific Air Forces with the activation of the 633rd Air Base Wing. The 43rd BW was officially inactivated Sept. 30, 1990. As part of an Air Force-wide initiated to preserve the heritage of the Air Force�s most-decorated units, the 633rd ABW inactivated Sept. 30, 1994, and was redesignated the 36th Air Base Wing. Since the airfield became operational as North Field in 1945, it has continually played vital roles in maintaining U.S. presence in the Pacific. Aircraft flying in and out of Andersen participated in both world wars, the conflict on the Korean peninsula, the Vietnam conflict, and Operations Desert Shield and Storm. Andersen forces also played a key role in Operation New Life, the evacuation of thousands after the fall of Saigon in 1975. During New Life, Andersen received more than 40,000 refugees and processed another 109,000 for onward transportation to the United States mainland. Andersen also played a key role in Operation Baby Lift, an element of New Life in which the U.S. evacuated 1,500 orphans from Vietnam and Thailand in April 1975. In recent years, Andersen played a vital role in Operation Fiery Vigil, the evacuation of the Philippines following the eruption of Mount Pinatubo in June 1991, and Joint Task Force Pacific Haven, the evacuation of more than 6,000 Kurdish people from Northern Iraq in September 1996. Today, with huge fuel and munitions storage facilities and dual two-mile-long runways, Andersen is an important forward-based logistics-support center for exercise and contingency forces deploying throughout the Southwest Pacific and Indian Ocean area.